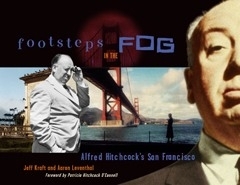 Footsteps in the Fog is a celebration of the San Francisco films of Alfred Hitchcock. The master director's familiarity with Northern California greatly influenced his decision to use Bay Area locations in several of his landmark motion pictures, and more importantly was often the source of inspiration for many of these same cinema classics.Three of Hitchcock's masterpieces were set in the San Francisco area: Shadow of a Doubt, Vertigo, and The Birds. In addition,Rebecca, Suspicion, Marnie, Topaz, Psycho, and Family Plot utilized Bay Area locations and/or were inspired by Northern California events and settings. Footsteps in the Fog examines these famous films, taking the reader on a journey around the Bay Area, while weaving together cinemagraphic intrigue, Bay Area history and lore, and the timeless elegance of San Francisco and its picturesque surroundings. Over 400 historical and contemporary photos are featured in the book, including impromptu off-camera images and shots from the films themselves—many never before seen! Alfred Hitchcock’s connection to the San Francisco Bay Area can be traced to the filming of Rebecca, his first American picture, in 1939 (released in 1940). Hitchcock made his first 23 films while in England, the country where he was born. Due to the severe downturn in the British movie industry in the 1930s, Hitchcock decided to leave England and continue his movie career in Hollywood. While filming Rebecca, which stars Laurence Olivier and Joan Fontaine, Hitchcock became friends with Fontaine’s mother and stepfather who lived in Saratoga, 40 miles south of San Francisco. Rebecca itself uses background footage of coastal scenes from Monterey County. By that time, Hitchcock and his wife Alma had fallen in love with the area and decided to search for a property to buy. The Fontaines recommended the Vine Hill area, near Scotts Valley. The Fontaines knew the area well, since Joan Fontaine had attended high school in nearby Los Gatos. In 1940, while filming Foreign Correspondent, Hitchcock discreetly purchased a ranch near Scotts Valley. A wine connoisseur, Hitchcock admired Northern California for its grape-growing climate, and he also purchased a vineyard adjacent to his ranch. and personal life, with his ranch as the jumping-off point: He entertained Hollywood stars, researched nearby locations for his films, and frequented San Francisco’s fine restaurants and culture. Starting with Shadow of a Doubt (released in 1943), some of Hitchcock’s most admired films were set principally in the Bay Area. His intimate familiarity with the region allowed him to blend his stories with the area’s unique geography. The “all-American” Santa Rosa is a cozy setting for the darkShadow of a Doubt. Big Basin Park, the Avenue of Tall Trees, San Juan Bautista, Cypress Point, and, of course, the streets of San Francisco are central characters in Vertigo (1958). The Birds (1963) is set in the quaint towns of Bodega Bay and Bodega, with a movie reference to a real-life bird attack near Santa Cruz. Some of his other movies, including Rebecca (1940), Suspicion (1941), Psycho (1960), Marnie (1964),Topaz (1969), and Family Plot (1976), also include a scene or sequence of scenes filmed in or inspired by the San Francisco Bay Area. Hitchcock, with the assistance of a talented team of collaborators (such as art directors and set designers Robert Boyle, Henry Bumstead, Joseph Hurley, and Robert Clatworthy), used four primary filmmaking techniques to convey the settings of these movies. First, the director filmed live-action footage with the principal actors on location. Hitchcock was a master of composing visually dramatic shots, tying the geographic characteristics of the location to the setting and plot. Second, he meticulously re-created interiors and exteriors on studio sets, exhaustively researching the subtlest details of actual locations to add authenticity. Third, Hitchcock took background footage on location, sometimes sending out a second unit led by the assistant director. He frequently used the resulting film as rear projection footage in combination with live actors on studio sound stages, known as “process shots.” Finally, he often modified the images he filmed with special effects, such as matte paintings, thus adding scenery or architecture to enhance the film’s settings. For purposes of this book, we use a broad definition of “the San Francisco Bay Area,” including other parts of NorthernÑand sometimes even the Central Coast ofÑCalifornia. If a location is a day trip away from San Francisco, it is eligible for inclusion. The pages of this book explore Hitchcock’s passion for the San Francisco Bay Area, and the meticulous use of its sites and locations in the scenes of his movies. We follow in Hitchcock’s footsteps, playing detective to unravel the mysteries of the San Francisco Bay Area locations featured in his films. We research the permits he filed, the notes he took, studio records of his filmmaking, and any other evidence he left, such as which doorways he chose to shoot, and why he selected one apartment building over another. We go scene-by-scene through his Bay Area movies. In following Hitchcock’s footsteps, at times we are walking a well-marked path. This book gratefully includes information discovered by authors Dan Auiler, Gaye LeBaron, Camille Paglia, Donald Spoto, François Truffaut, Kyle Counts, and others. However, in many instances, we uncover footsteps other Hitchcock authors have not identified, which often have been obscured by the passage of time. We examine buildings and locations pictured in Hitchcock’s films and compare these on-screen images to historical and contemporary photos of the same buildings and locations. Additionally, we show archival photos of Hitchcock on location, behind the scenes of his movies, to round out the images of Hitchcock’s San Francisco Bay Area. We also include maps to place the buildings and locations in their geographic context. We then combine the pieces, placing the images and descriptions with insights into why Hitchcock selected the locations he chose to use. To complete the story, we explore Hitchcock’s personal experiences in the area he came to call a second home: Dining at the popular Ernie’s, socializing with the venerable San Francisco columnist Herb Caen, living in Scotts Valley, and enjoying the Bay Area’s culture, food, and lifestyle. What we ultimately discover is that Hitchcock’s footsteps make an indelible mark on the region, and in turn the region leaves a dramatic mark on his films. His movies offer insightful glimpses into the geography, lifestyle, history, and glorious mystery of the San Francisco Bay Area, spanning four decades. Hitchcock left a gift for residents and visitors to the Bay Area: an enduring image of not only drama and suspense, but also a view of Northern California from the eyes of a true fan of the area. The co-author of Footsteps in the Fog is an avid Alfred Hitchcock fan who has seen every available Hitchcock film. A long-time Bay Area resident, Kraft graduated from UC Berkeley with a Masters Degree in Public Policy. He lives in Oakland. The co-author of Footsteps in the Fog was born and raised in the San Francisco Bay Area. His passion for photography and suspense films led to his collaboration with co-author Jeff Kraft. Leventhal lives in the East Bay area.